From left to right: Organic wheat with high inputs, organic wheat with recommended inputs, 10 foot border, conventional wheat with recommended inputs, and conventional wheat with high inputs. We initiated a 4-year study at the Aurora Research Farm in 2015 to compare the corn-soybean-wheat/red clover rotation in different sequences under conventional and organic cropping systems during and after the transition to an organic cropping system. This article will discuss weed densities in conventional and organic wheat. We provided the management inputs for wheat in both cropping systems under high and recommended input treatments in a previous article (http://blogs.cornell.edu/whatscroppingup/2017/12/01/organic-compared-with-conventional-wheat-once-again-has-more-rapid-emergence-greater-early-season-plant-densities-and-fewer-fall-weeds-when-following-soybean-in-no-till-conditions/), but we will briefly review them. We used a John Deere 1590 No-Till Grain Drill to plant a treated (insecticide/fungicide seed treatment) Pioneer soft red wheat variety, 25R46, in the conventional cropping system; and an untreated 25R46, in the organic cropping system on September 27 at two seeding rates, ~1.2 million seeds/acre (recommended management treatment for a September planting date) and ~1.7 million seeds/acre (high input treatment). The wheat was no-tilled in both cropping systems because of the paucity of visible weeds after soybean harvest (9/23). We also applied Harmony Extra (~0.75 oz/acre on 10/27) to the high input conventional treatment at the tiller initiation stage (GS 2-October 27) for control of winter annuals (chickweed, henbit, and common mallow) and winter perennials (dandelion). We also reported in the above article that we walked along the entire wheat plot (~100 feet X 10 feet) to count all the weeds on 10/27 just prior to the Harmony Extra application to the high input conventional wheat plots. As in 2015, organic compared with conventional wheat generally had lower weed densities in the fall, especially in the field in which corn was the 2014 crop (Table 1). Weed densities, however, were very low so we speculated that yields would probably not be compromised. Dandelion was the dominant weed specie in the fall in all plots. Apparently, the last cultivation of soybean on July 20 removed existing or late-emerging dandelions, whereas the observed weeds in the conventional cropping system apparently emerged after the June 21 Roundup application. Weather conditions were extremely warm in October (6 degrees above normal) so wheat (and weeds) got off to an excellent start. Ensuing weather conditions, however, were much colder than normal with November, December, January, March, and April averaging more than 2.5 degrees below normal. In fact, March 1-April 30, was the 3rd coldest period on record at the Aurora Research Farm (34.20 average temperature) (http://climod.nrcc.cornell.edu/runClimod/cb248220aa6e4a42/10/), only eclipsed by the infamous 1975 and 1978 early springs (average temperatures of 34.10). Consequently, winter wheat greened up about 2 weeks later than normal in 2018. It is not clear on how the cold winter and early spring conditions affected winter annual and perennial weed development but probably it was delayed. Early spring weed densities were taken at the GS2-3 stage on 04/10, about 10 days after green-up, again by counting all the weeds along the entire length of the plots. Dominant weeds included dandelion, common mallow, and chickweed. 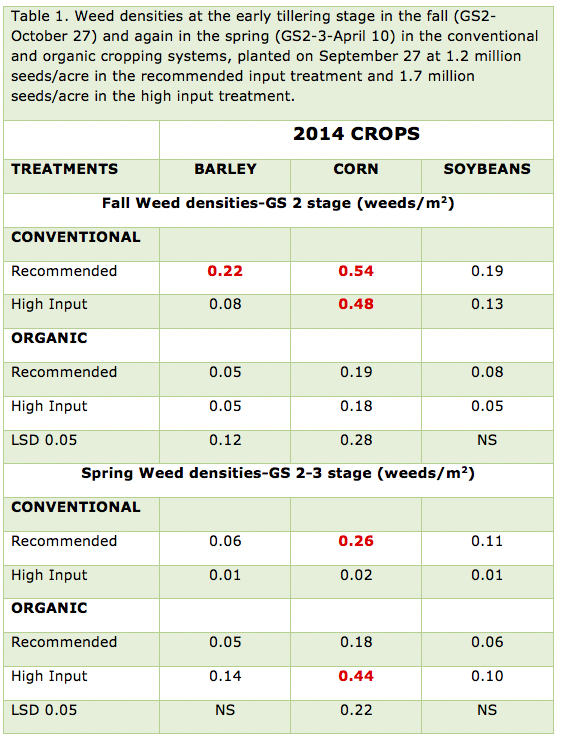 As in the fall, weed densities were extremely low and probably would have no significant effects on yield (Table 1). There was a cropping system by input interaction in the field with corn as the 2014 crop because of very low weed densities in conventional wheat with high inputs (Harmony Extra application) and higher weed densities in organic wheat with high inputs (seeding rates and N rates). 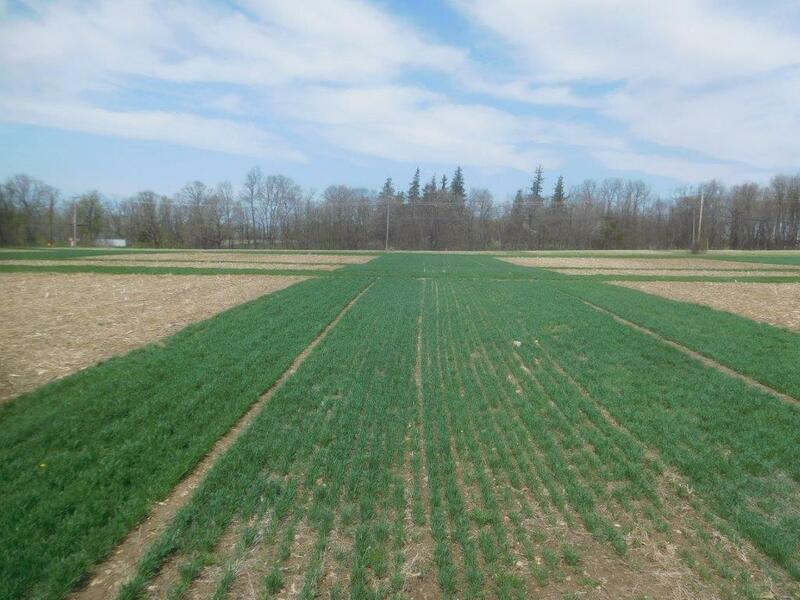 High input management in organic wheat did not reduce weed densities, which agrees with the 2016 data (http://blogs.cornell.edu/whatscroppingup/2016/04/05/no-till-organic-wheat-continues-to-have-low-weed-densities-in-early-spring-march-31-at-the-tillering-stage-gs-2-3/). Some organic growers believe that wheat should be planted at a higher seeding rate to reduce weed densities, but our study does not support that speculation. Our data does support the idea that if weed densities are low in organic soybean (<2.5 weeds/m2), organic wheat growers can no-till wheat into soybean stubble without fear of high weed densities. More research, however, should be conducted to compare no-till and conventional tillage organic wheat. In conclusion, no-till organic and conventional wheat had very low spring weed densities about 10 days after green-up. The cool conditions in April prevented rapid shading by the wheat canopy so perhaps the weeds that were present in early April may interfere with wheat yields, but impacts should be minimal because of the low densities. On April 15, organic wheat looked as good as conventional wheat (picture). It remains to be seen, however, if Kreher’s composted chicken manure, the N source for organic wheat (60 lbs. /acre of actual N pre-plant +50 lbs. /acre of actual N on 3/21 in high input and the single 75 lbs. /acre of actual N as a spring application in recommended management) can provide enough available N for maximum yield in organic wheat.